CleanedRite Pest Control Barking offer a complete solution to domestic or commercial pest problems. We will quickly control pest problems caused by rats, mice, moles, ants, cockroaches, pigeons, birds, rabbits, flies, bed bugs and wasps nests removed. CleanedRite Pest Control London have a wealth of expertise gained from many years working in the pest control industry in London. Our pest control technicians will eradicate pest problems safely, efficiently and in a discreet manner. With the technical expertise to identify solutions based on our knowledge of pest behavioural patterns, their infestation rates and the likely recurrence levels. We will recommend and install tailored pest control treatments and pest prevention programmes that effectively deal with the problems that arise and help you comply with current Health and Safety legislation. Call 020 3813 1799 for helpful advice and information or contact us online. CleanedRite Pest Control Docklands have a 24 hour emergency call out service covering the London, East Ham and Barking area. Call now for details of our pest control solutions and 24 hour call out service. 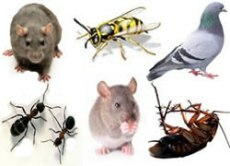 If you have pest control problems such as a wasp nest, mouse or rat infestation, moles in the garden, flies, insects, ants, cockroaches, pigeons, bed bugs, fleas, or any other pest problems in London, Stratford, Hackney, East Ham, Barking or Docklands contact CleanedRite Pest Control on 020 3813 1799 for more information.